Lymphocytes are mononucleate, nongranular leukocytes of lymphoid tissue, participating in immunity. They are found in blood, lymph and lymphoid tissues such as spleen, lymph nodes, tonsils, Peyer’s patches, appendix. etc. The lymphocytes are of two types. 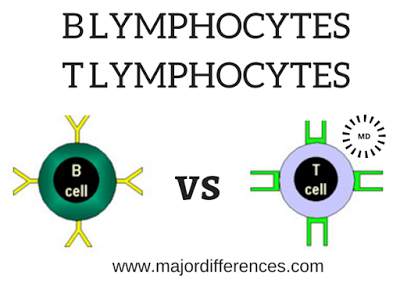 They are B lymphocytes and T lymphocytes. 1. Both are White blood cells or Lymphocytes. 2. In adults, both cells are derived from hematopoietic stem cells in the bone marrow but maturation of T cells occur in Thymus. 3. During embryonic development, these cells develop from the stem cells of liver and yolk sac. 3. Both are involved in acquired or adaptive immunity or specific immune response. 4. Both possess antigen binding cell surface receptors B cell receptor (BCR) and T-cell receptor (TCR) responsible for specificity, diversity memory and self/non-self recognition by the immune system. 5. Both produce memory cells Memory B cells and Memory T cells responsible for immunologic memory in Adaptive immunity.